The first feedback I received from Acharya Venkatesh was, “Your body will change, your face will change, your mind will change. The secret lies in the eyes, within”. And here I am! Three years later. Three years full of practice, study, and self-inquiry. Three life-enhancing winters with my teachers, every year leading me to find a deeper understanding and connection to myself. Uprooting and discharging the deep-rooted patterns, wounds and blind spots that kept me from peace, strength, and health. When I first came to Atmavikasa my body and mind were full of tension, a lot of it held in my womb, which manifested in a missing period for more than six years. This tension was not only held in my body but also in my mind. I was unconsciously holding on to patterns in my mind, to conditioning from society and family. Control feels safe but it’s a false friend. I was unable to let go, to surrender, which was exhibited by the tensions in my body and particularly in my asana practice. Forward Bends and savasana were my nightmares. 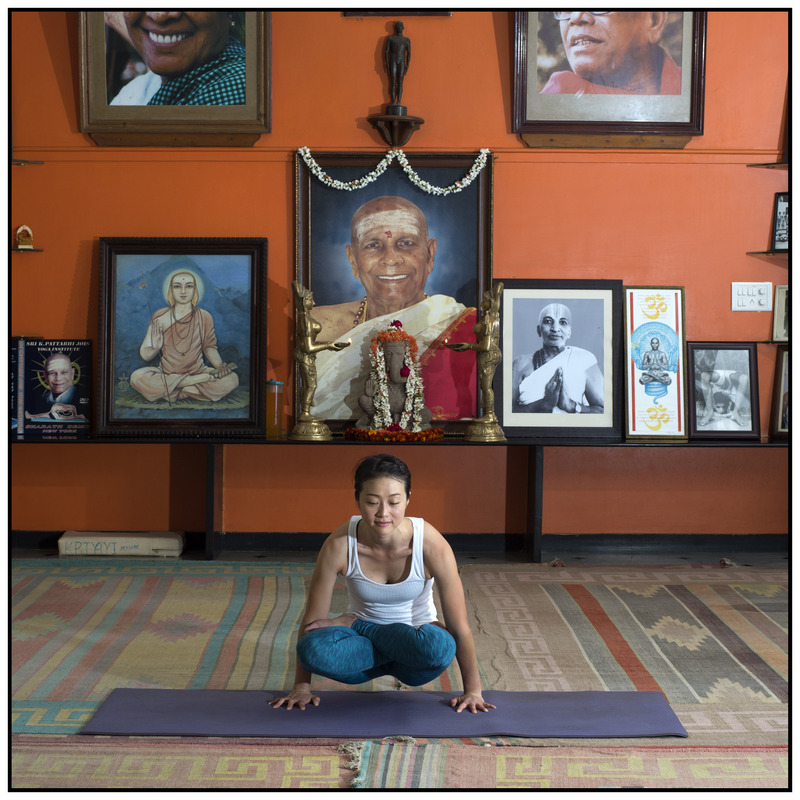 Click here to read more about Atmavikasa Centre of Yogic Sciences in Mysore. I knew I needed to heal for years. However, the approaches I had tried in the West had not yielded much fruit. I tried therapy, allopathic medicine, “yoga” etc… but it only made me feel temporarily better. I needed to get to the root of my problems, but nothing seemed to take me there. To be honest, not menstruating didn’t bother me so much. I even forgot about it and often reflected on how convenient it was, especially for traveling. Not bleeding had many practical benefits. I can now see that focusing on the positive was a form of defense mechanism that kept me from the pain of what was happening. My experience with doctors wasn’t the best. All they would do is tell me that I would get osteoporosis, and not be able to become a mother. Their only solution was hormones. This didn’t make sense to me and went against all my instincts. I flatly refused their advice and continued with my search for an alternative answer. There I was, feeling completely alone, a woman in a patriarchal world, a world where talking about menstruation and menstrual disorders is still a taboo. A world where female bodies are weak, unclean (especially when bleeding) and are being used in mass media as sexual objects to further fuel the capitalist agenda. A world where the androcentric bias of language degrades women, leaving them with a sense of fear, shame, and inadequacy in their subconscious. A fear hindering women to live and believe in their full potential. A fear that disallows a woman to embrace her femininity in its entirety. But as often the case, such psychological hindrances are the result of silently agreed normalities, and thus difficult to see and very difficult to break free from. But this freedom is exactly what I found through Yoga. It all sounds quite nice here, yes, the way to health, but it brought me face to face with my demons, with my false self-beliefs. Confronted with the conditioned ego I saw all the things I was previously trying so desperately hard to hide from myself. As difficult truths began to come to the surface, I was faced with the choice to continue suppressing my feelings and keep up the mask, or to be complete honest with myself and begin the journey of unravelling the complex puzzle of my defence mechanisms and the historical conditioning that had kept me clinging to my old notion of self. I chose one of the 5 Yama’s to focus on, Satya, which means truth, and stopped telling lies to myself. The first winter at Atmavikasa I learned to inhabit my body and to trust its innate intelligence. With the aid of asana practice, I went deeper into my physiology and learned to relax and to let go. Holding postures for a prolonged time. Staying, finding stillness no matter how much my mind protested. I focused on the simplicity of natural breathing as my body became motionless and my mind became quiet. I began to be able to observe my thoughts from a distance, without attaching to them, instead of training my focus to stay with body and breath only; to stay in the present moment. Implementing this approach in daily life I was slowly able to stay in my body without losing myself in fear-based patterns. However, still the patterns took me over, and at times I was overwhelmed by shame. Talking about my missing period to my teachers elicited a deep inner discomfort, but they were incredibly kind and compassionate, a reaction I had not experienced up till then. They suggested a special diet and prescribed certain asanas, nauli, sungazing, and barefoot walking. 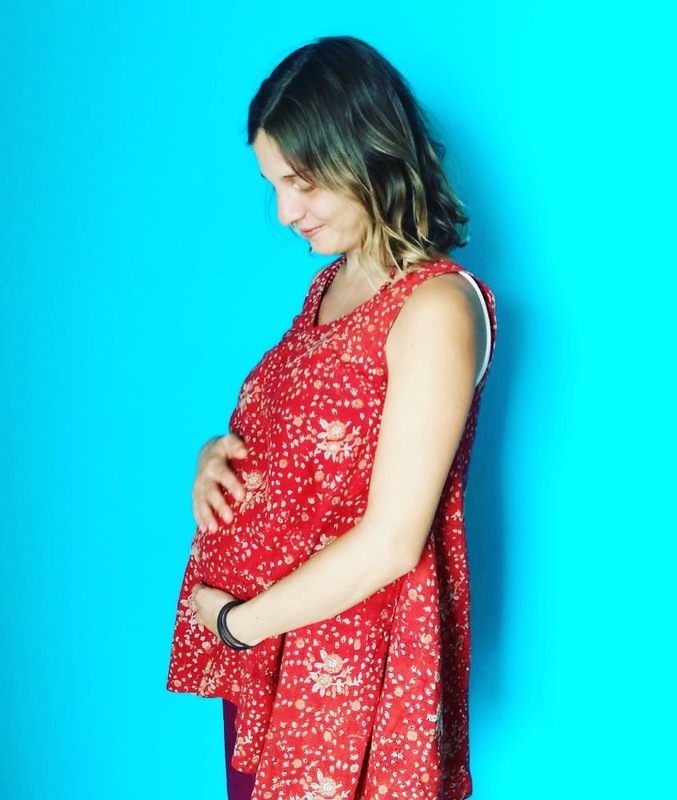 For the first time, I began to have hope and confidence around the absence of my period and fully embraced the issue into my consciousness. Being able to talk freely about not menstruating, eventually, without shame, I found that a lot of women suffer from irregular or missing cycles. And all of them share similar emotional experiences: no one to talk about, no one taking them seriously, facing a taboo, and therefore initiating a process of self-delusion. Blaming contraception as a reason but not questioning the continuous intake of the drug. Or simply “forgetting’’ the fact that female organs are not working like they are meant to. For one year I practiced very strictly. My body and mind were more focused and at peace, but still, my period had not returned. There were clearly some hidden parts of myself I was still not able to see. My teachers helped me to go even deeper inside myself, and gradually I began to remove the blocks that kept me from feeling the subtle energies within my body. I got to know my controlling mechanisms and I learned to let go. I freed myself from the erroneous belief that invulnerability kept me secure and more lovable. I started to be less hard on myself, to leave shame behind. I allowed myself enjoyment, slowed down, and devolved continuous connection to my emotional self. Importantly, I rejected the western stereotype of beauty and stopped holding my belly in. I laughed more, I relaxed more, and I ate more. I felt my cycle for the first time in years! Wow! I had tears in my eyes when I felt my reproductive organs working again. I didn’t bleed yet, but I knew! I knew this feeling which is like nothing else. And as my emotions and energy began to flow freely, my blood began to flow too. I write this account from Mysore. My appearance has changed, as Acharya had predicted. Furthermore, I am becoming a mother! I had only two bleeding periods before I conceived, so the medical doctors were incorrect. No replacement hormones needed! To read another story of healing through Yoga, click here. Acharya Hema told me “she is feeling blessed’’ to witness my journey, turning from a girl into a mother”. Well, I couldn’t feel more blessed for the true benefits of yoga, and for the teachers who have guided me with all their compassion, knowledge and skill. Before my cycle returned, I met a beautiful man, with whom I practice the yoga of relationship and who was and is always supportive of my process to heal. I believe that this conscious relationship played and continues to play a vital part in my healing process. Today we are building a healing center, in order to share what we’ve learned so far. With ample choices of teacher training courses branded ‘Ashtanga TTC 200hrs’, it can be difficult for new practitioners to differentiate and navigate the world of yoga qualifications. Raja yoga is understood as one of the classical branches of the yoga tradition. Literally, the term ‘Raja Yoga’ connotes, the culmination or highest state of yoga. Raja means royal; it is so named because it enables the yogin to reach the illustrious king within oneself, the supreme self or atman. In various texts or scriptures of yoga, this term is used in different context as well. In Hatha Yoga Pradipika; one of the most popular traditional Hatha yoga texts; it is mentioned that ‘the knowledge of Hatha yoga is only for Raja Yoga’. (Verse 2/chapter 1). I often get approached by people, who ask for recommendations of ashrams in India where they can study yoga. At some point in time, both beginners in yoga and experienced yoga practitioners long to come closer to the source of knowledge. Before suggesting a concrete place to go, I always ask, what is the real motivation for them to undertake such a journey. Is it the desire to advance their physical yoga practice, is it the search for spiritual growth, a way to heal from a trauma to detox body and mind, or maybe just an idea to spend a holiday in a useful way? 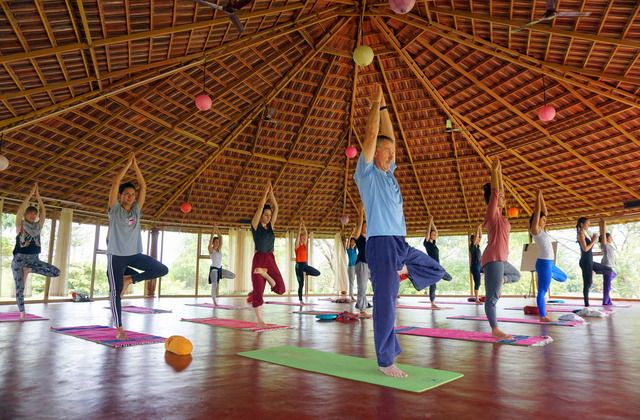 For many, a yoga retreat in a beautiful set up in Goa or a residential stay in a yoga school can be just a much better option.